I’ve solved another puzzle. The skyline problem. I have to admit though, I started out totally wrong. I set out to write a solution that would only require a single pass over the list of buildings, which was really hard. It would have been doable if all buildings only overlapped with the last one. I spent a few hours going down that path before I realized I could do it so much simpler. The solution is done in Scheme (<3) for once. On Stack Overflow there is a code-golf for the shortest solution but I didn’t manage to do that though. My solution counts 690 characters, so I can’t really compete with the current record of 40 characters. I’m just glad I solved it! ; Map a function over a vector. ; The value and the index of the value. ; Create the vector with the proper width. ; Loop over the buildings and update the vector. ; Iterate over vector and create list. ; Add the last coordinate to the vector. I’ve spent a few minutes solving the Cracker Barrel puzzle in Python. Today were my first few lines of Python so be gentle if my code is an eyesore. It’s not very fast though. Therefore I’ve implemented using the Java F/J framework as well, which is a *lot* faster. # Define the the puzzle with 14 pegs and 1 hole. # Define all possible moves. # as true in the puzzle list and the first position as false. # Remove the peg that just got jumped over. # A game is finished once the sum of the list is 1. # Returns a list of all the moves we can make in the current game state. # If the game is done, print out the moves. * Instantiates a new move task. * Flips the move's direction. * This function checks if a certain move is valid for a given gameboard. * Applies a move to the board and returns a copy of the board. * Returns true if there is only one more peg left on the gameboard. * Returns a list of all possible moves in this gamestate. // We can only make one move. // We make the move and then start the process all over again. // Create the left and right tasks. // Count the number of games where the top hole has a peg in it. // Initiate the F/J Pool. I’ve been increasing my linux mojo the past months and I’m bothered by the fact that every time I open a terminal (ctrl-alt-t) it opens up in a new window. A git window here, quick vim edit there, htop etc. Before I know it I have a lot of terminals I don’t even use anymore. Setting titles to tell the windows apart was a partial solution but not good enough for me. A primer can be found here: http://www.danielmiessler.com/study/tmux/. It helped me out in getting started. After about a day I got the hang of the basic commands and loved it. Today I realised I could solve the problem of multiple terminals with tmux. So I will explain to you how I did it. We have tmux up and running. So by now you know you can run tmux attach to attach to any running session. Running tmux attach -d does the same thing. Except, it disconnects every other client (terminal window in our case) that is running that session. So if you are facing a terminal window with a tmux session and you type tmux attach -d in an other terminal window, the former will detach from the tmux session. So, first of all, we make sure that whenever we open up a new terminal we are dropped in a tmux session. Don’t close this file yet, because we’ll change it soon. If you were to try this out you would see that everytime you open up a new terminal window it will open tmux. Great! Next, when we open up a new terminal we want to make sure we jump to our previous tmux session and kill the other window. Easy enough. As you know by now, this will disconnect all other sessions. Since we start up tmux immediatly when creating a terminal, detaching from tmux closes our terminal. Excellent, we fixed it! When you would try this, don’t be suprised if you can’t open any terminals anymore. This is normal. When you have no tmux sessions running and you execute tmux attach -d, tmux will tell you you have no sessions and quit. Ergo, you need to tell tmux to create a session if there is no running session. Fair enough. This piece of setting makes sure the new session is created when you run tmux attach -d when no sessions are present. Hi, Today I was trying to get an thumbdrive to work on OSX, Windows and Ubuntu. Most people format their thumbdrive as NTFS to store files bigger than 4 GB. Luckily for us there is a thing called exFat which can store files up to 17 179 869 184 GB. I think that is pretty future-proof. So what did I do? Note that /dev/sdb is my thumbdrive. Yours can differ. To get information on your drive you can use df and locate your drive. /dev/sdb is your drive and /dev/sdbn where n is any natural number is your partition. You can disregard those because we’re going to delete all of them. So execute following command to open up fdisk. Now you should see the fdisk. You can type several commands in this little (old) program. You can see all of them by typing m.
We want to create one new partition, so we type n. It will ask for some values which you can simply press enter for the default values. Now we have a partition which is not saved yet. But first we have to set our flag. The current partition should be flagged Linux. You can see this by typing the fdisk command p. To change the flag to exFat we have to type in the command t. Fdisk will now ask for a number indicating the flag you want to set. We want number 7. (You can see all the flags by typing L). If we have done all this we simply write away our settings by typing the command w in fdisk. Note that you should replace the /dev/sdb1 part with your partition identifier. If you have done this your USB stick is ready! So, the first thing we do is represent our pantry (the stuff we can pick from). One way to go about doing this is by representing it in a functor food where we have the name, the weight and the calories. X is W + RestW. X is C + RestC. They are pretty straight forward. We take the weight/calories of the first element and add it to the result of our recursive call. 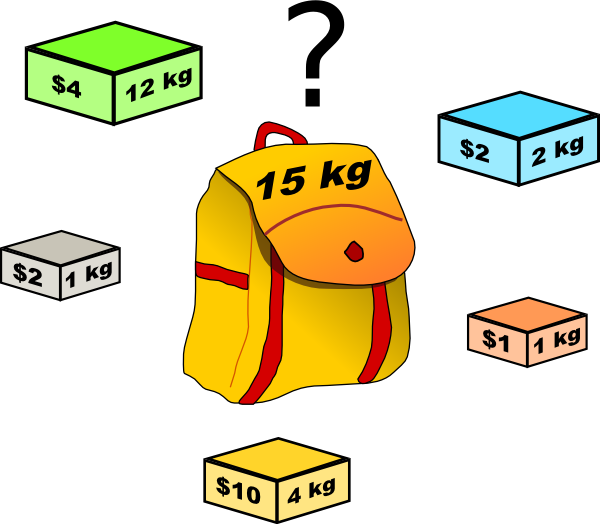 Now we have to generate all possible solutions of combinations we can put in our knapsack. This can be all elements, the first, the second, the third,.., the first and second,.. We need all possible sublists. Yay, we can do this! So, if we have a given list, and a possible sublist, how do we check if the latter is an actual sublist? First clause: both the first elements of the list are the same. We can discard those, and call ourselved recursively. Second clause: the first two elements differ, but our sublist could start somewhere in the middle! So we discard our first element of our list which we check if it contains our sublist and call ourselves recusively. ?- subseq(R, [1, 2, 3]). findall(LegalKnapsack, legalKnapsack(Pantry, Capacity, LegalKnapsack), ListOfLegalKnapsacks). maximumCalories([LEGAL | LEGALS], MAXCALS) :- calories(LEGAL, CALS), maxCals(LEGALS, CALS, LEGAL, MAXCALS). When we we unify a list of legal pantry lists we traverse them one by one. We first calculate the calories of our first list in maximumCalories. Then we check it with maxCals. This is pretty straightforward stuff. We check to see if every next item in the list has more calories. If not, we skip it and check the next one. This will determine the sublist with the most calories.